They're not valid reasons... They feel super important...but they're not- they're excuses. I had to laugh at myself today as I started thinking about all the excuses I come up with. Nothing like "She can't trust anymore... she was mentally incapacitated... she was one-handed and blind..."
I don't know what we're having for supper. Wasn't it three days ago that you last showered? Wasn't there a package to mail? ps- I was just at a friend's blog and she had a perfect answer to this today. I love it when that happens! Thanks Shelley! It's huge, vast, and I felt like an explorer braving the grand unknown. In the last few days I've spent over 8 hours in blogland reading, surfing, jumping from blog to blog. I've never put so much concentrated energy into checking out other people's blogs. The blogs I usually read are blogs that I've come to organically (for lack of a better description), they're written by friends, or found through a link in a friend's post or recommendation. Rarely have I taken the time to really search out other artist's blogs. I had an assignment you see, find 14 links to specific blog posts that fit your theme. I chose inspiration because it's an endless fascination to me and I figured I wouldn't mind putting in some time reading about what inspires people most. Then I split it up into smaller subthemes like "finding inspiration at home", or "being brave and acting on your inspirations" or " about blogging your inspirations". But I found it really hard to just type in something like "inspired by art materials blog" into Google and find something like I wanted. So I took another tack and tried picking artists who I thought really really love their art supplies and then reading their blog until I find something that fit. Really NOT the most efficient way to search out an unknown post on a specific topic. Finally, feeling completely loopy I would end up just blog hopping and forgetting completely what it was I had been searching for. 1) Pictures matter- a lot. One of the things that would keep me on a blog were the pictures. Was the color nice, were they crisp, did they appeal to me aesthetically or emotionally? Did the photographer shoot from unexpected angles? Some of the pics that appealed to me least were people's trip photo's. Many that appealed to me were photo's of someone's living room, or a vignette in a window. Nothing special as it's focus but so so pretty to look at when done right. One blog I really enjoyed because of the photo's was Raining Sheep. 2) I like the post written in a friendly "just stopped to chat" sort of tone. That might just be because that's how I like to write so that's a personal preference. I also like it when a blogger really comes across with a voice that's authentic. They really share who they are and aren't just hyping their art or niche interest. Ranting occasionally is ok- if it's something your passionate about, but if you do it every post it gets annoying and I want to move on. 3) I like good content and I like it when others are sharing something I find interesting or valuable. For instance, I really enjoyed this post by Tanner Christensen at his Creative Something blog. Which really turned out to be a great find. Many of the tools or ideas he expresses in his blog are things I spoke on in my book but from a slightly different perspective. 4) I really like tutorials. I love seeing people's ideas and projects brought to life. I'm a craft book junkie though and a good tutorial is just like a fix for me. It makes me want to see more. So blogs that either had their own tutorials or linked to tutorials by others were super fun. 5) I like a blog that's not overwhelming to look at. 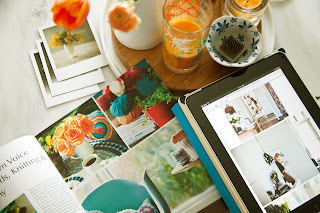 Too many colors and textures and fonts and it makes me want to hop along to the next blog. That being said, I do like colors and textures and pretty fonts but feel like there has to be a balance and something that's over the top in this area (or has too much information in it's sidebars, or has too many flashy things going on, or plays music...) just overstimulates me. Making use of the pages option is a very good alternative to putting it all on the front page. Here's a blog that I feel does it just right. I want to spend time here. So the best part about my time spent blog hopping was that it gave me a clearer vision of what I'd like this blog to be. Some things I think I'm doing fairly well, some things I'd like to improve, and some things are just really really good ideas that I think you'd enjoy too. Like video tutorials and digital art. I'd like to learn more about these as well as just how to take better photos in general so I could create really cool visuals for the blog. I really do love how blogs are organic and are constantly changing and evolving by their very nature. So how about you? Anything you can think of to add that you really feel draws you to a certain blog? Is there something you feel you're doing well on your own blog? I'd love to hear your thoughts on this. As always, thank you for your comments!!! Just to spread a little extra love today I put together this little clay and wire pendant tutorial for you. I hope you enjoy it and Happy Valentine's Day!!! - Little flying heart stamp or mini wings stamped. -White acrylic glaze: you can use fluid acrylics or acrylic with a little glaze mixed in. I used Studio by Sculpey antiquing medium since I had some on hand. - Acrylic clay roller: You can sub anything round and non stick here. I've used the glass tube my vanilla beans came in for years. - Stylus: Again, anything sort of sharp can be subbed here. I've started using this because it has the sharp end and I can use the handle to roll the clay smooth. - Oven: ideally a little oven just for baking clay but your kitchen one will do. Step One: About 3" from end of wire make a small loop. Then make a quick bend down and form wire into a square-ish shape. Wrap wire around twice and then cut wire. Step Two: Break off 3-4 squares of the blue and "condition" the clay by rolling it, smooshing it over, kneading it a bit, then rolling and smooshing it again. Continue until clay is soft and malleable. Step Three: Form clay into a squareish shape a little bit bigger than your wire form. Press your wire form into the clay. Step Four: Firmly press stamp into clay. Use rubber paintbrush to smooth out marks you don't want. Step Five: Tear off a small piece of red clay and condition as above. Form into a tiny little heart. Press into place and then use stylus to write "love" into cay and then add any scratches or marks you'd like to see. Step Six: Bake as directed by manufacturer. I do bake mine for a little less time then recommended and then turn off the oven. I leave the tray in the oven as they cool, keeping the oven door shut. Step Seven: Using a rag or paper towel rub paint into recessed areas and stamped areas. Then using a clean part of the rag wipe across the top surface of your pendant cleaning off the paint. If desired seal with a clear acrylic medium. 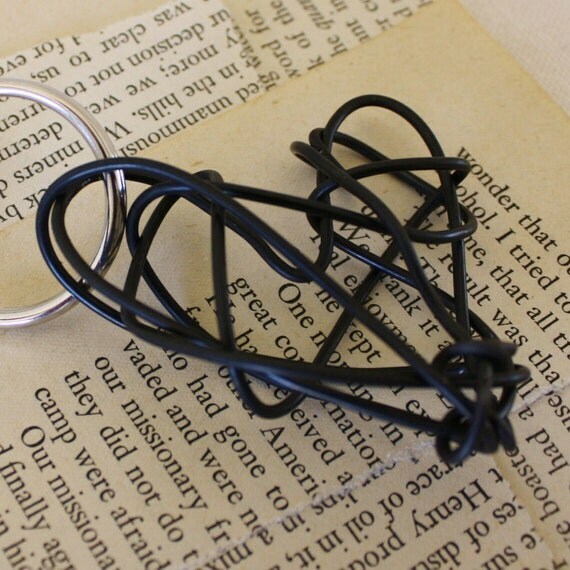 Add a jump ring, and a bit of ribbon and you've got your own little flying heart necklace. You can see the finished pendant at the top of this page. Have a wonderful day, and I'm wishing you all love today!!! It's All About LOVE today and I thought I'd share a few of mine with you. -Shelley, from Single Stone Studios (art top left) is one of my very best friends and a wonderful artist/designer. I love her vinyl decals- they're gorgeous designer art for your walls. I have her "fly". -Cristi, from 2 if by Sea (art top right) is another one of those love to talk to you friends of mine, and I truly think she's one of the most talented jewelry designers out there. She puts beads, trinkets, pendants and wire together in ways that are always just right and just perfect. I have a few of her necklaces and a bracelet that makes me feel amazing whenever I wear it. Just tonight I was cleaning off my craft mat and rejoicing in it's ability to look completely grimy and yet clean up so spectacularly. It's an amazing bit of technology I've gotten really really attached to. My Sakura glaze pens and souffle pens are my go to's for making marks on paper, canvas, and metal. It's the writing on metal part that really hooked me. My wire. It's oily and grimy but comes in big ol' spools that just make me happy to see them. 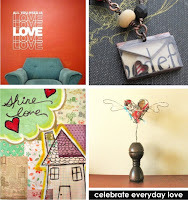 Artist's Giveaway on Create Mixed Media- A Creative Bloom Prize Package!!! 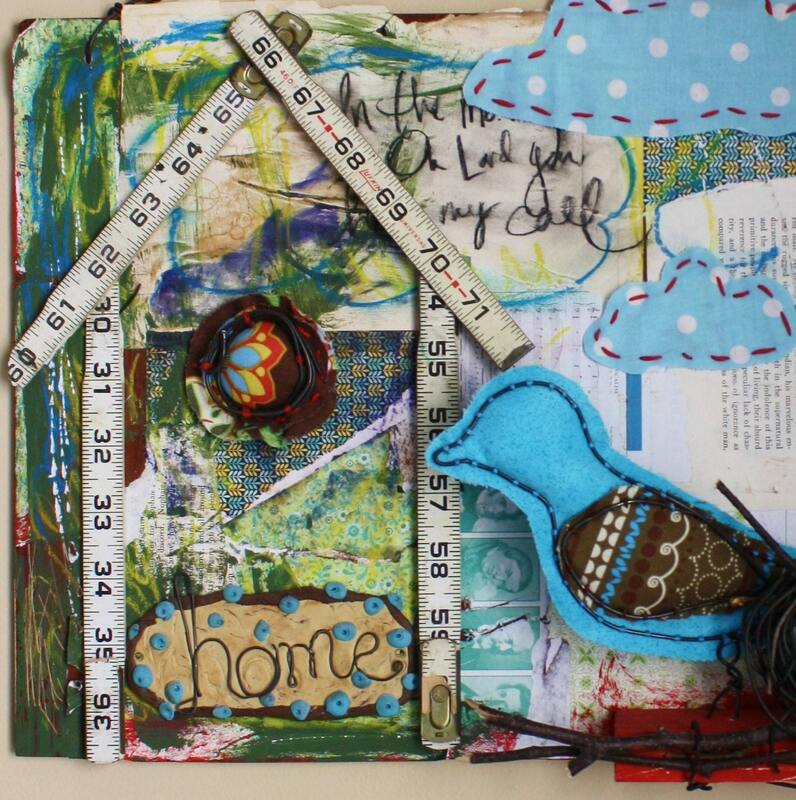 I am SO excited because today on the new Create Mixed Media website they posted their very first giveaway- of my book! Because this is a very special giveaway they're not just giving away the book; it's the book, plus wire, plus needles and floss, plus fabric scraps, plus a heavy duty wire cutter, plus a needle nose pliers, PLUS a scribble heart I made for your wall and a wee little one to put in your pocket. 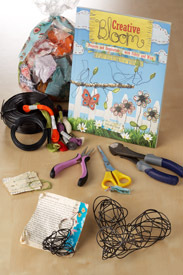 It's EVERYTHING you need to get started creating wire and fabric sculptures with a bit of art to boot. So run, hop, or jump on over to this site and register to win this amazing, fabulous, crazy cool prize package!!! So I've always struggled with time management. I always think I can get way more done then I actually can. I also don't figure on the little time sinks, or attention grabbers that come each day. You know, an e-mail to be answered here, a bathroom that NEEDS cleaning, the birthday present you forgot to buy and have to get before tomorrow. That sort of stuff. Not that all of those things are bad- in fact a lot are really great and exciting, but still, take time. So when I was sitting here the other night, trying to prioritize the blog, my etsy shop, and my online course- I picked etsy because I'd promised Feb. 3rd would be the reopening. But I'd promised handmade book tutorials here too. AND oops- there's the overnight trip to Wisconsin that I knew about but hadn't really considered when making my schedule. So last night, after we got back from Wisconsin, I sat down and reopened my etsy shop. I have to say it feels really good. I listed just a few new things but I have a ton more in the works. Including a scribble heart lamp that's pretty adorable. I'm also going to be taking the step to list some of my original art from the book. It's super hard to part with some of these pieces, but I know it's the right thing to do too.One of the things I've learned through the process of owning a shop is that if I sell my work, I tend to make more because I want to replace it. I've also learned that not every piece of art I make was intended for me. It may be by me, it may have come out of my heart and soul, but it was not intended by God for me to keep. I know I'm getting a little mystifying here, but I think you'll know what I mean. I've talked to people who get so much more out of my work then I originally intended because it speaks to them about different things. Like the bird nest I created because I loved the lines and beauty of it- but a friend saw as an empty nest that spoke to her about her life right then. I'll be back soon with more handmade books, as promised. I'm just going to stretch that into next week a bit. I bet you won't mind. :) But I'm wondering how you feel about parting with your art. I know making prints is a great solution that many people take, but if you sell original art, how do you do it? I'd love to have you all share! thank you! Yay! I'm excited to share this tutorial with you. It was going to be the second of a two part post about handmade books but so many of you were interested in how to make different types of books I thought I'd turn this into book week on the blog and do a few different tutorials. So I have a sweet stitched canvas book in the works, an elegant exposed binding book, and today's lovely; a spiral bound notebook made from an old book. The book was my grandmother's and had seen better days so for a while now I've been tearing out the pages to use as collage material. I was left with a cover and the fly leafs. Hating the thought of throwing anything away, I used it to make this vintage-y recycled notebook. SO I hope you like what you see, and I hope it gives you some ideas. I promise too that tomorrow's book tutorial will NOT use the Cinch machine. I'm a little in love with it myself, but thought that demonstrating some bookbinding methods that don't use my handy dandy new machine would be good. :) Enjoy! Step One: Tear the cover off your book and then separate the front and back cover from the spine. You'll be left with three pieces. For this project we're only using the covers, not the spine. Step Two: With a scissors, carefully trim the torn edge of the cover. Step Four: Using a page from your book as a template, or a ruler, cut your cardstock into half and trim to length. I used approx. 10 sheets of cardstock for a total of 20 pages. Step Five: With your Cinch machine, punch holes along the side of one of your book's two cover pieces. This will be the front cover of your notebook. Pull out your sliding rule at the left of the machine, and note the length of the piece. Then, using the written guide on your cinch, pull out the knob it tells you to. My book was slightly irregular so to be sure I got the right number of holes, I punched a sheet of scrap paper first. Make any adjustments, and punch the front of your cardstock again. Repeat with second cover board, but flip this one before you punch so that the inside of the cover board is facing up. The first hole at the top of my notebook's cover is a slighty further in from the top edge then the bottom hole is from the bottom of the notebook. By flipping the bottom piece over, and punching it wrong side up I'm making sure it will line up with the top cover of the notebook. Step Seven: Count the number of holes punched and count out that many hooks on your wire binding. Then cut wire at that point. I have 15 holes punched, I counted up 15 hooks, and then cut my wire between the 15th and 16th hooks. Step Eight: Hang wire on side of Cinch and assemble the book. I did the two covers, right sides facing first, and then added the punched cardstock. Step Nine: With the book assembled, all you have left to do is to bend the wire tines flush to the wire edging of your spiral binding. To do this, adjust the knob on the back left side of your Cinch to the appropriate wire size (3.4" on mine) and then placing the notebook flush against the back of your Cinch, and under the pressing bar, push down on the handle. This will crimp your wire perfectly. Step Ten: To protect your skin during use, use a needle nose pliers to curl the sharp ends of your wire so that the cut edge is flush against the rest of the wire. Decorate the cover of your book, and you're done! **At this time you may opt to use a gel medium to seal the tape's edges. Just brush over the tape, and along the edges of the tape.